For research on materials and structures of cultural properties, non-destructive and non-contact methods are required frequently. Therefore, investigation techniques using X-ray play an important part. With X-ray radiography, one of the techniques using X-ray, it is possible to investigate the inner structure and the layer of materials, both of which cannot be visually confirmed, in a non-destructive and non-contact way by using the difference in X-ray transmission levels resulting from a difference in density and thickness of the material composing cultural properties. The latest research was conducted on works of Chohachi Izu, a kote-e (plaster relief) artist who was active from the late Edo period to the early Meiji era. Chohachi left a large number of statues and kote-e works – paintings drawn with plaster using a trowel, a tool used by plasterers to plastera wall. 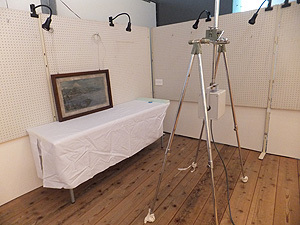 To investigate the techniques for producing these works, we conducted an investigation into the inner structures of these works using X-ray radiography on the second floor of the Izu-no-Chohachi Art Museum in the town of Matsuzaki, Kamo-gun District, Shizuoka Prefecture, on May 19 and 20, 2015. As a result of our research, we identified the layered structure of a kote-e work sets in frames, the inner structure of statues and their production techniques.